SYNOPSIS: A new animated adventure in Warner Bros. Pictures’ LEGO® franchise, “The LEGO NINJAGO® Movie” stars Dave Franco, Justin Theroux, Fred Armisen, Abbi Jacobson, Olivia Munn, Kumail Nanjiani, Michael Peña, Zach Woods, and the legendary Jackie Chan. Jackie Chan (“Kung Fu Panda,” The Karate Kid”) stars as Master Wu; Justin Theroux (“Megamind,” “The Leftovers”) is Garmadon; Dave Franco (“Neighbors 2: Sorority Rising”) plays Lloyd; and Olivia Munn (“X-Men: Apocalypse”) is Lloyd’s mom, Koko. Making up the secret ninja crew, Michael Peña (“Ant-Man,” “The Martian”) is Kai; Fred Armisen (“Portlandia,” “SNL”) voices Cole; Kumail Nanjiani (“Silicon Valley,” “The Big Sick”) is Jay; Abbi Jacobson (“Broad City”) plays Nya; and Zach Woods (“Silicon Valley,” “The Office”) voices Zane. 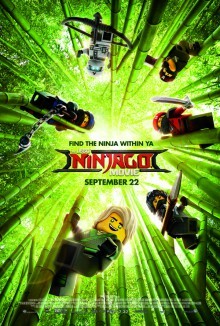 “The LEGO NINJAGO Movie” will be directed by Charlie Bean, Paul Fisher and Bob Logan. The screenplay is by Bob Logan & Paul Fisher & William Wheeler & Tom Wheeler and Jared Stern & John Whittington, story by Hilary Winston & Bob Logan & Paul Fisher & William Wheeler & Tom Wheeler and Dan Hageman & Kevin Hageman, based on LEGO Construction Toys. The film is slated to open on September 22, 2017, in both 3D and 2D. From Warner Bros. Pictures and Warner Animation Group, in association with LEGO System A/S, a Lin Pictures/Lord Miller/Vertigo Entertainment Production, “The LEGO NINJAGO Movie” will be distributed worldwide by Warner Bros. Pictures, a Warner Bros. Entertainment Company. Join LatinoScoop at an exclusive advance screening of THE LEGO NINJAGO MOVIE in select locations below. Click on the link below for your city. If you download a screening pass and aren’t able to use it, please share it with someone who can attend. There are limited number of passes available for each location. Screening passes are available on a first-come, first-serve basis. Additional passes will not be added once they are all redeemed. All advance screenings will take place on September 16. Anyone downloading a screening pass is advised to arrive early to secure seating. The theater is intentionally overbooked by the studio to ensure a full house. Plan accordingly to arrive with enough time.